1. Preheat your oven to 170C / 160C for fan assisted ovens. 2. Line a cupcake tin with cases. 3. Using an electric whisk, cream the butter until really soft and creamy. Add the sugar and lemon juice, and continue using the electric whisk. 4. Add the eggs, and continue beating. Don’t worry if your mixture starts to look “curdled”. 5. Gently fold the flour in to the mixture, using a large metal spoon, one spoon full at a time. 6. Add two heaped teaspoons in to each paper cupcake case. I managed to make 33 cupcakes with this quantity of mixture!! 7. Bake in the oven for approx 30 minutes, or until golden brown. Don’t forget to do the skewer test at the end… The skewer should come out clean. 8. 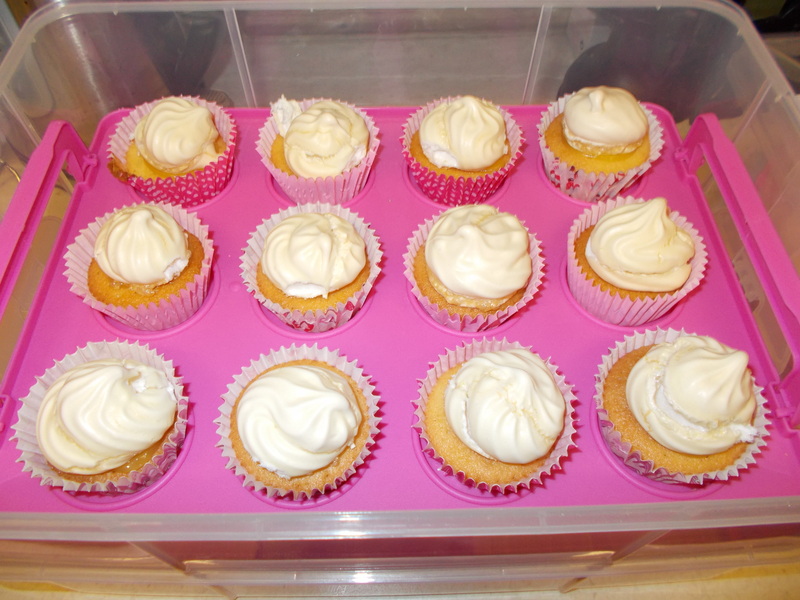 Once the cupcakes look golden, remove from the oven, and allow to cool fully in the tin before turning them out on to a wire cooling rack. 1. Preheat your oven to 130C / 120C for fan assisted ovens. Line a baking tray with greaseproof paper. 2. Add the egg whites to a large bowl, and using an electric whisk, beat on a slow speed for approximately 3 minutes. When the whites start to look like they are “forming together”, turn the speed up to maximum, and beat for a further while (could take up to 10 minutes) until the egg whites start to “peak”. 3. Gently add the sugar combination, one spoon at a time, and fold in to the egg whites using a large metal spoon. This allows the air to remain in the mixture. 4. Once all the sugar has been combined, scoop the mixture in to a piping bag, and “pipe” the required quantity of meringues on to the baking / greaseproof paper. I always ensure to make more meringues than I need because some often break when they are cooked. 5. Pop them in the oven, and allow to bake for 45 minutes. Once the time is up, turn off the oven, but leave the meringues in there to cool fully. 2. Scoop in a good dollop of lemon curd (Asda’s own is yummy!!). 3. Once the meringues are cool, pop one on the top of each cake, using the lemon curd as “glue”.